This past weekend marked one of the peak moments of migratory bird activity globally, at least in an aggregate sense. Did you notice? Family obligations kept me on the sidelines during Global Big Day, but I did manage to sneak in a little birding before traveling. Black-throated Blue Warblers may not be rare in my part of the world, but they’re still one of my favorite songbirds. Corey had an astonishingly good weekend of birding with the Global Big Day on Saturday, which he made local by doing a Queens Big Day with Cesar Castillo. That netted them 136 species, and more birding on Sunday morning got Corey even more. Of all the birds he saw over the weekend, from Cape May Warbler to Seaside Sparrow, Least Tern to Blue Grosbeak, his favorite was a Black-billed Cuckoo that played hide-and-seek with Corey and Cesar in Kissena Park. 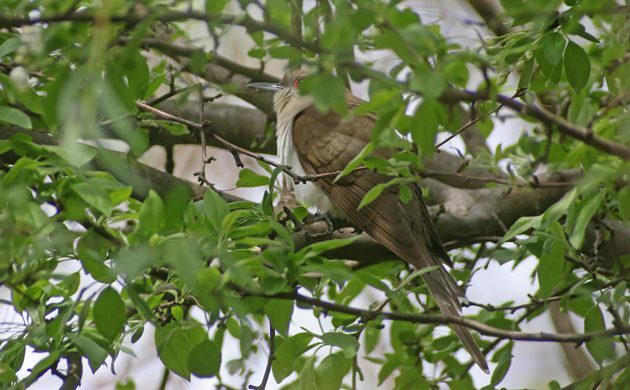 Black-billed Cuckoo can be a tough bird to see at all so to see the same individual several times was worth burning a few precious minutes during a big day. No question here..the pair of Papaun Frogmouths on the Daintree River, In Cairns, Australia. After moving a few miles away from my Chimney Swift-hosting apartment complex, I was delighted to see (well, hear more than see) them wheeling over my new home this pas weekend — one of my favorite birds!